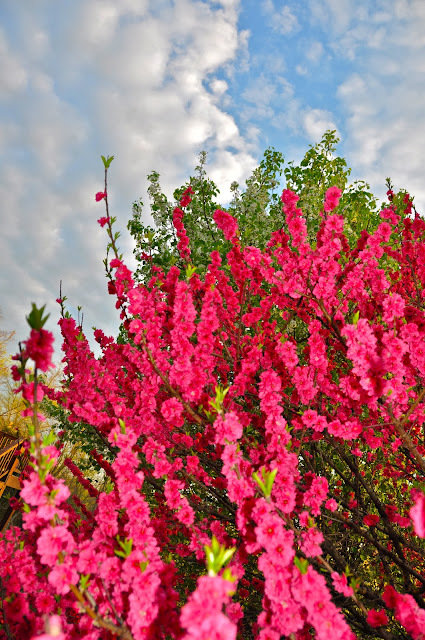 As we await another storm in Taylorsville - heading our way this afternoon, we are enjoying the beauty of Spring in Full Bloom. 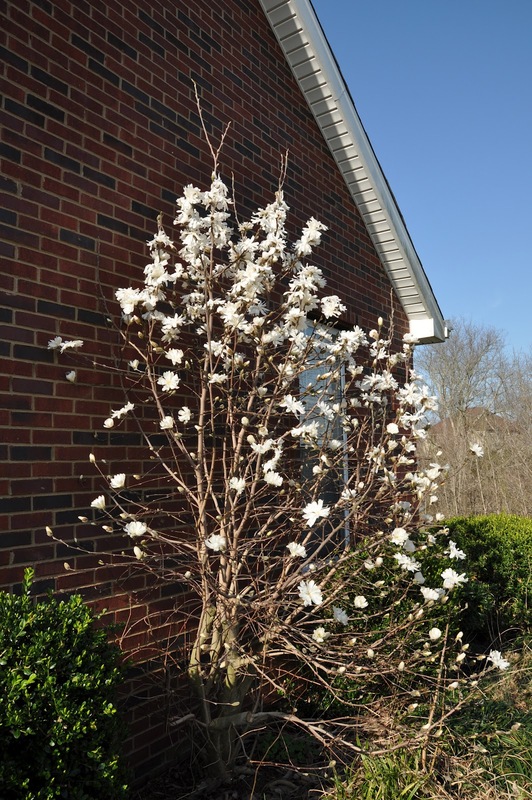 Some of the plants and trees that usually wait for late April or May to show their glory have already blossomed. It is quite a gorgeous array of color. St. Simeon Skete weathered the March 2nd storm relatively well compared to many in the area, however, our buildings did take a good beating. The roofs on all three buildings have hail damage and need replacing. The siding, especially on Anna House looks like a machine gun splattered holes into it. ...and today we wait for another “severe thunderstorm capable of damaging winds and large hail”. We are under a severe weather watch until 8PM. It seems Spring 2012 is here with a fury. Our Nazareth House Apostolate Board Members met this weekend for the NHA Annual Meeting. It was a productive meeting and we are eagerly looking forward to things to come. Nazareth House Apostolate is extremely pleased to welcome its newest Board Member: Matthew Drake of San Francisco. Thank you to those who rallied together to help buy the additional materials for the well to furnish water the NHA Compound in Sierra Leone and provide water for the school and area neighbors in Kabala. We have now raised enough money for the project to be completed. James will be buying the materials this week. 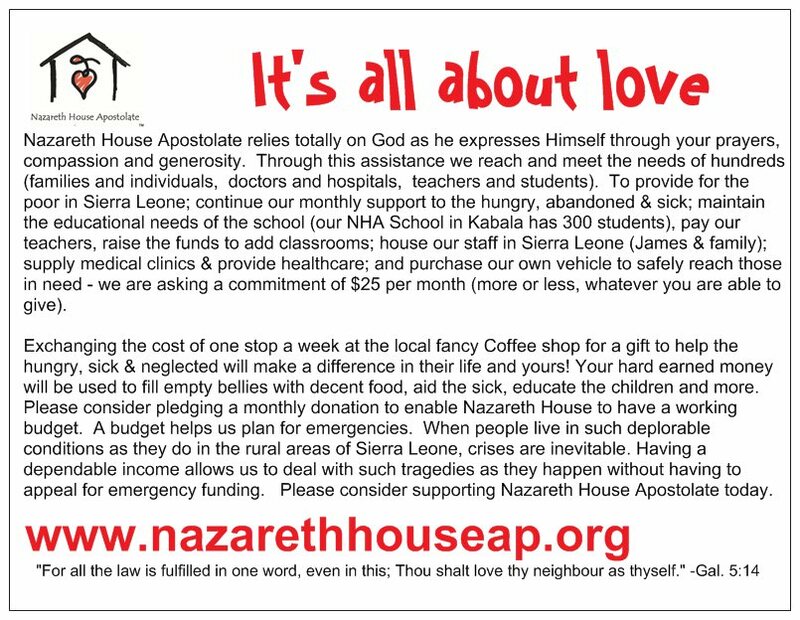 We are running a bit behind on the March regular monthly provision for those we serve in Sierra Leone (paying the NHA teachers, providing rice, etc.) but hopefully we’ll receive the donations soon to get caught up and pay our teachers who are eager to buy food for their families. Today is James’ birthday and he is celebrating with his family in Freetown. We wish a very happy birthday to him and thank him for his tireless work for NHA. St. Simeon Skete has had several pilgrims visit recently. Those that come to the skete are seeking a deepening of the spiritual life. We rise to begin the day in private prayer at 3:00 AM and then meeting together at the chapel at 4:40 AM for Lauds and The Liturgy. We are in prayer, and those who arrive step into the ongoing stream of that prayer, they are here for that purpose - that is why they come. If you are preparing to apply for a visit at the Skete make sure that you first understand what it is about. You will not return home, rested and revitalized, but most likely quite the opposite. You will be tired and worn-out, but in a productive, purposeful & meaningful manner - bringing back with you what you have revealed from your time at the Skete seeking God, to be implemented in your daily life. We try to maintain an atmosphere of prayer at the Skete at all time, however sometimes others don't consider this. We ask that those visiting for a short time (an hour or day) remember that others are in prayer and respect this. Please do not drive through, revving up the car engine or talk loudly. This especially means NO PETS on the property at any time. We understand those coming to visit on pilgrimage would not bring a pet, especially while staying at Anna House, but this is also the rule for brief visits as well. One of the Nazareth House Apostolate board members, Claudio Lopez, underwent a series of surgeries in December. The students in our Nazareth House Apostolate School in Kabala were very worried about him. I received these pictures yesterday. They were thinking of Claudio and wondering how he is doing. NHA is truly a family! As James was returning to Kabala from picking up the supplies to begin the task of finishing the well at the NHA Compound, he stopped by a village on his way home. No one was around at first, except this little boy named Lansana. He is 18 months old and one of a set of twins. His mom was out fishing in the stream for their supper and dad was at work on their farm. Grandma was inside the hut tending to the other children. Regular daily meals and snacks are not a routine part of his day, fending for himself and hunger is. Lansana has no toys, no games, not much of anything. Yet, he is satisfied, happy. No complaints of the past, no worries for the future he takes in life moment by moment. Ribs showing, protruding belly full of worms, he has found a single nut. At this early age he is determined and resourceful. He attempts to break the nut with a rock. After several tries he is successful and he eats the fruit from within. So we must look at what is presented to us with reality. We can’t be puffed up and think we can fix it all - God tells we aren’t able to do this on our own. But he makes a point of telling us that it is something He wants us to try to do - (with open hands) help out. And so we must. Please join us, eyes wide opened, knowing we can’t make it go away but also knowing we can and will help out - loving one person at a time. in Kabala at our Nazareth House School the children were celebrating another saint - St. Valentine. In America we are attached to our chronos time, measured time - as on a clock. “...got to be here by 10, appointment here at 2, meeting at 4, dinner at 6, soccer at 7...” That’s not how things are in Africa. Oh, they try to be at work, school or church at a specific scheduled time, but being “on time” is not always the result. In Africa, they are more “event” oriented, not time oriented. and arrived a month later than expected - it didn’t matter. And the fact that our students were celebrating St. Valentine’s Day on St. Patrick’s Day -- well - our student’s didn’t think there was anything odd about it at all. It was a joyous event regardless of its timing. What DID matter was that so much love was shared. It mattered that people thousands of miles away, across an ocean, all the way to the West side of the America were praying and thinking about children in Kabala, Sierra Leone. A church family (children and adults alike) joined together to cut, paste, color, glue, and decorate handmade Valentines with handwritten messages of love to send to children in a foreign country - children they have only met through this blog. Not only did they make these messages of love but they sent them, paying and arranging the shipping on their own, in coordination with the NHA headquarters in Taylorsville. and to the Parish of St. Mark’s in Portland we say THANK YOU, we love you and are so grateful for your prayers and love. ...and to you all - we say THANK YOU for being a part of the Nazareth House Family! The unity brought about by such love and care for one’s neighbor is amazing. the provision is shared by someone in another jurisdiction or another denomination that shuns the other. 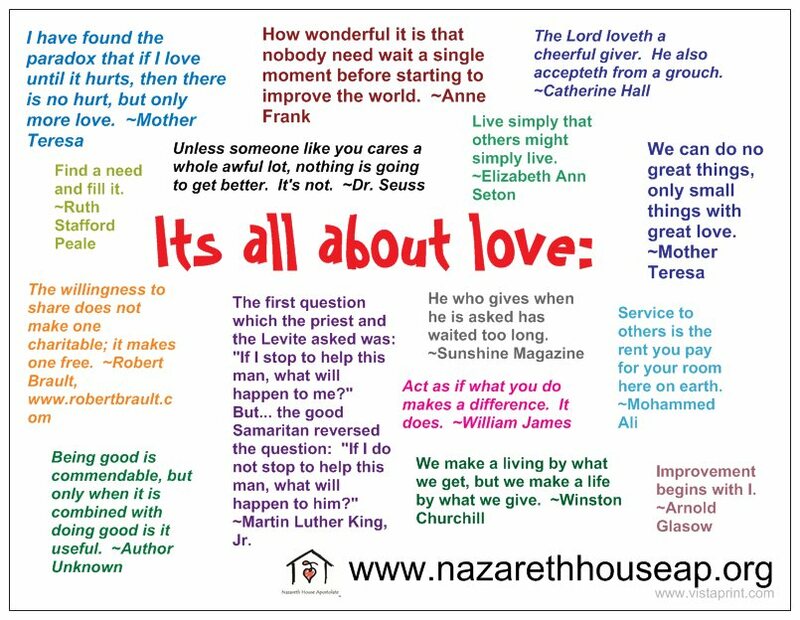 They are apart in their daily lives but united in their gift (donation) to Nazareth house expressed in bags of rice for the hungry, medicine for the sick, water for the thirsty. They stand unified in the love for those in need.